We recently published the MinMinas estimate of September crude oil production and while the press release (and our story) focused on the (slight) increase month-over-month and year-over-year, the interesting angle is the surprising stability dating from 3Q16 – spanning three years. 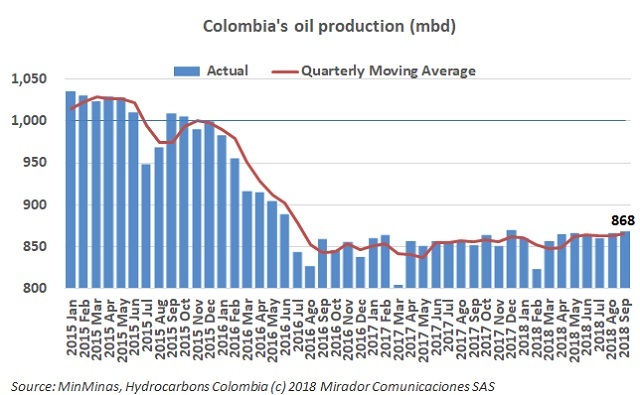 Oil prices slipped slightly this week on continued fear of a global economic slowdown but Colombia’s policy makers cannot seem to decide if this is a good thing or a bad thing. I would have thought this was a straightforward question with a straightforward answer. 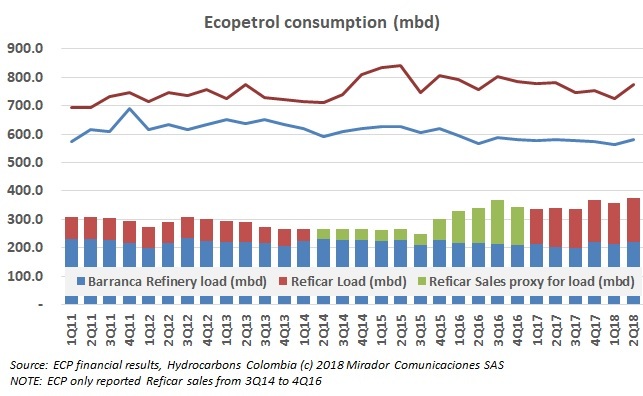 Over the past few months we have published a few articles on petrochemicals in Colombia (and a seemingly endless stream of articles in Hydrocarbons Mexico). It is clearly a significant political issue even if the economics may be questionable in some circumstances. 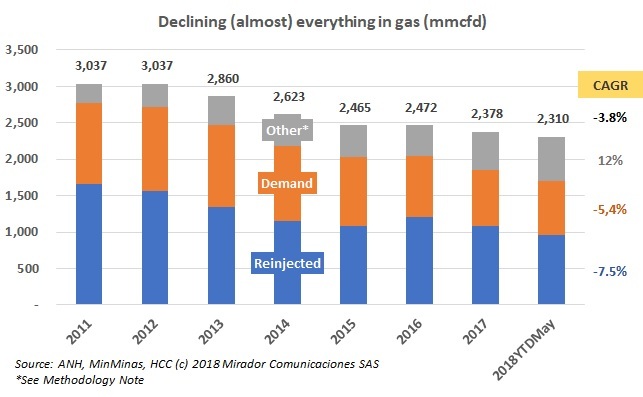 We do not have an exact start date for Hydrocarbons Colombia but it was around this time of year, which allows me to pick just about any week in October and write an anniversary column. 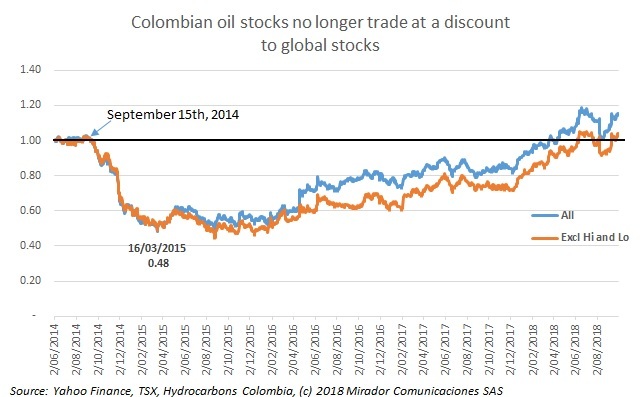 Oil prices were up in 3Q18 but investors in Colombian-focused stocks seemed to shrug that off. Only Ecopetrol (NYSE:EC) and Gran Tierra (TSX:GTE) were up over the quarter. The reopened debate about fracking in Colombia reminded me, once again, that we live in a world where nothing is true. Based on a reader question, we decided to look at the available data on reinjected gas. That did not turn out to be easy, at least going back in time, (See Methodological Note) but did allow us to look at some other interesting questions like solving the looming supply gap. At the recent ACIEM Enercol Conference, there was a very interesting debate about the second regasification plant. Even I have to admit the bureaucrats made their case. Where will we find gas? 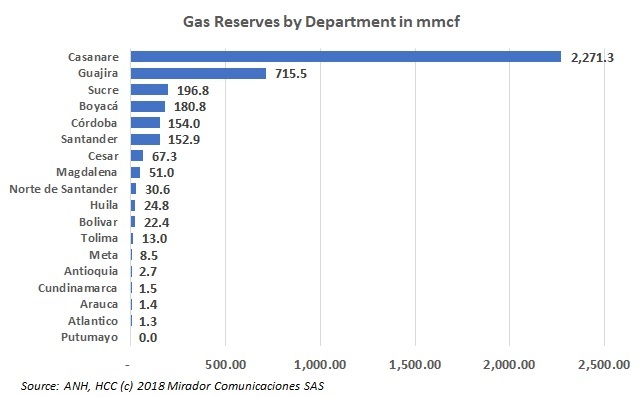 Last week we showed a number of graphs about oil reserves. This week we have the same charts but for natural gas. As we noted a few weeks ago, the Colombia-Canada Chamber of Commerce’s Mining and Energy Committee prepared a set of recommendations for María Fernanda Suárez, the new MinMinas. These were delivered to her at a private meeting in Cartagena. We have translated the full document and obtained the Committee’s permission to publish it.